All of your video and camcorder tapes to digital DVD for £5 each – please see the picture shown here – ALL sizes of tape. The tapes at top left (SONY) are BETAMAX while the ones to their right (FUJI and KODAK) are the VHS tapes which everyone had. Below them are the COMPACT VHS (VHS(C) tapes which were small VHS camcorder tapes which fitted into a full sized VHS adaptor (shown with one tape with open case). 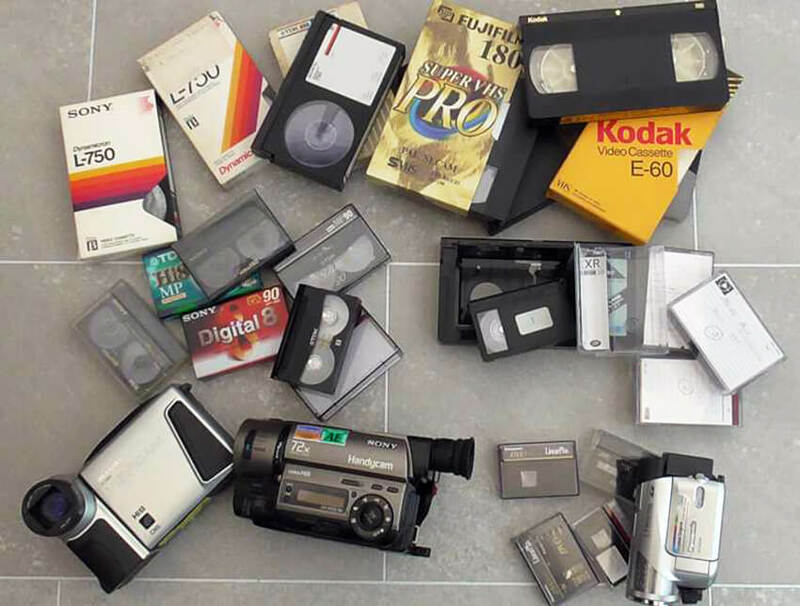 The tapes to their left (TDK Hi8, Sony Digital 8, and the black one) are all 8mm camcorder tapes and below them are two examples of what 8mm camcorders looked like. Finally, the ones at bottom right are MiniDV (digital) tapes with an example of a MiniDV camcorder. To order, please click on ‘Order Form Download’ tab at left of this screen. Other services can be appraised by clicking relevant tab at left – please DO read the Customer Feedback. Fill in an order form on our order form page and we will convert your Video and Camcorder tapes to Digital DVD for just £5 each!